Advantages: An examination of Russia’s first inter-continental airliner. Red Star Series Number 31 is the latest volume from author Yefim Gordon, this time teamed with Vladimir Rigmant. 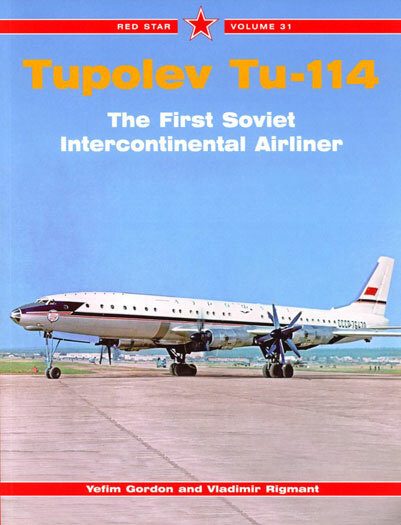 In this volume we are treated to a comprehensive examination of the TU-114, which gave the Soviet Union its first airliner with true inter-continental range. On direction of the Soviet Government the Tupelov OKB took the proven Tu-95 and developed it as the Tu-114. By the late 1950’s this approach gave the USSR a turbo-prop that operated at jet speeds. The Tu-114 did suffer from limited appeal, with no exports recorded and only 31 entering service with Aeroflot. By the mid 1970s airframe fatigue meant the end of this graceful aircraft. As with all the Red Star series this volume covers initial concept, development of the type, in-service history and an in-detail section. Unsurprising for a book authored by Yefim Gordon among others, this book is a comprehensive examination of the subject matter. It will not be to the taste of all, and the applicability as a modelling reference is limited with only the old odd-scale Eastern Express kit available. The TU-114 was the flagship of Soviet airtravel for over 20 years and this book offers a chance to expand your knowledge of this graceful type. Recommended for fans of the more esoteric Russian aviation types.